Please go to this page to see all the kindergarten numbers worksheets on this site. 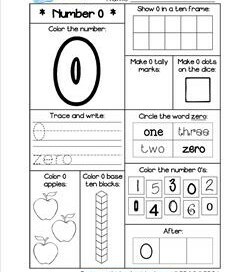 In this number 0 worksheet kids color the big number 0, trace and write the number 0 and the word zero, count objects, base 10 blocks, tally marks, and more! 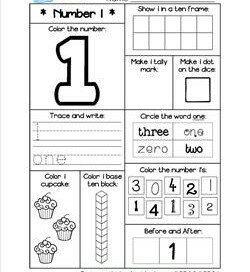 In this number 1 worksheet kids color the big number 1, trace and write the number 1 and the word one, count objects, base 10 blocks, dice, and more! 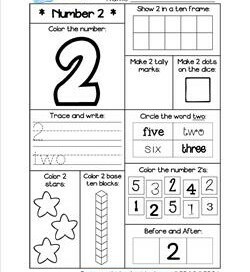 In this number 2 worksheet kids color the big number 2, trace & write the number 2 & the word two, count objects & base 10 blocks, & more! 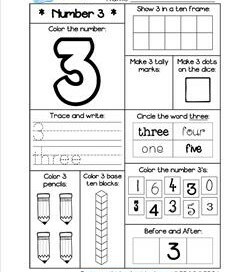 In this number 3 worksheet kids color the big number 3, count objects and base 10 blocks, show 3 in a ten frame, tally marks, dice, and more! 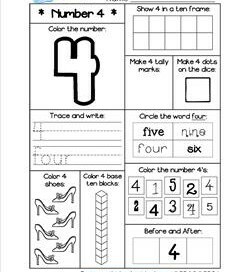 In this number 4 worksheet kids color the big number 4, trace and write the number 4 and the word four, count objects and base 10 blocks, dice, and more! 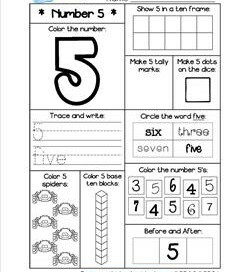 In this number 5 worksheet kids color the big number 5, count objects and base 10 blocks, show 5 in a ten frame, tally marks, dice, and more! 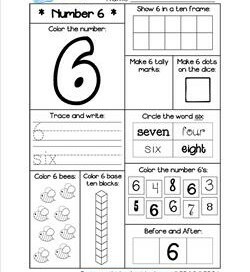 In this number 6 worksheet kids color the big number 6, trace and write the number 6 & the word six, count objects & base 10 blocks, tally marks, etc! 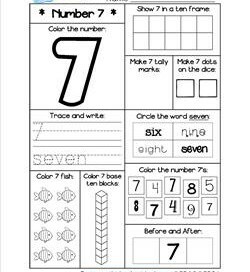 In this number 7 worksheet kids color the big number 7, trace and write the number 7 and the word seven, count objects, tally marks, dice, and more! 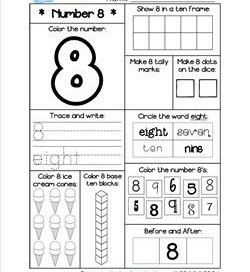 In this number 8 worksheet kids color the big number 8, trace and write the number 8 and the word eight, count objects, tally marks, dice, and more! 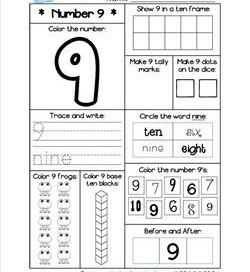 In this number 9 worksheet kids color the big number 9, trace and write the number 9 and the word nine, count objects, tally marks, dice, and more! 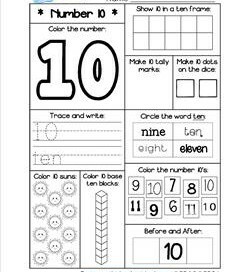 In this number 10 worksheet kids color the big number 10, trace and write the number 10 and the word ten, count objects, tally marks, dice, and more! 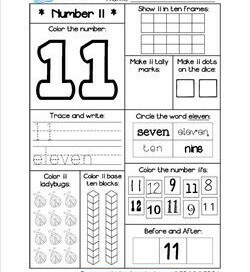 In this number 11 worksheet kids color the big number 11, trace and write the number 11 and the word eleven, count objects, tally marks, dice, and more! 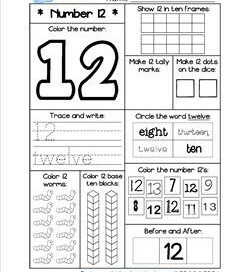 In this number 12 worksheet kids color the big number 12, trace and write the number 12 and the word twelve, count objects, tally marks, dice, and more! 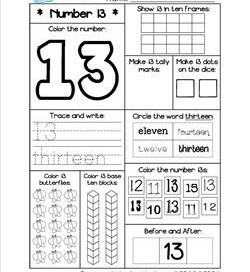 In this number 13 worksheet kids color the big number 13, trace and write the number 13 and the word thirteen, count objects, tally marks, dice, etc! 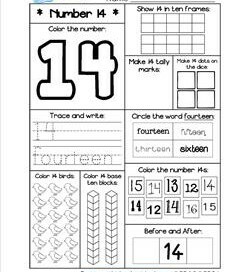 In this number 14 worksheet kids color the big number 14, trace and write the number 14 and the word fourteen, count objects, tally marks, dice, etc! 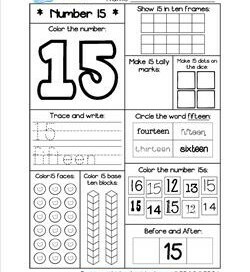 In this number 15 worksheet kids color the big number 15, trace and write the number 15 and the word fifteen, count objects, tally marks, dice, etc!